A while ago I started doodling out different types of kaleidoscope blocks in search of the perfect block. I was originally inspired by my Sunrise Delight quilt, where I took the traditional kaleidoscope block and mixed it up a little. After a bunch of doodling, I couldn't narrow the blocks down and decided to keep going until I had enough to make one a month. Yet I kept doodling to have enough awesome sketches to make two a month. Thus the idea for the Kaleidoscope Block of the Month was born. With this BOM, I'll post two blocks a month to Craftsy for just $2.50 the first week of the month from January to December in 2016. The blocks will finish at 12.5" unfinished, and if you make all 24 blocks, you'll have a quilt that will measure 72" x 48". Of course you could always take one of the blocks and make an entire quilt out of it. While the blocks will be paper pieced, they're all fairly simple with no seams to match up outside of the point of the kaleidoscope. 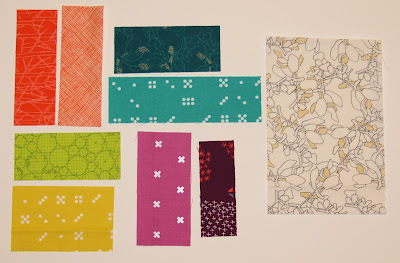 Here's a look at the fabrics I'm using... I chose four colors, orange, teal, lime and purple and selected a light and dark fabric for both. The backing will be one of my favorite Carolyn Friedlander fabrics. Kaleidoscope Fabric: Approximately 8 yards of various prints. For this quilt I will be using eight one yard cuts. You could also use a fat quarter bundle for a more random look. If you go that route, I recommend at least 32 fat quarters that contrast with your background fabric. I can't wait to see what everyone makes with these fun blocks.